Mighty Malls | All your favorite brands on sale. All in one place. All your favorite brands on sale. All in one place. This bundle includes: Custom Xbox One S 2TB Console and Crimson Omen controller, vertical stand, full game download of Gears of War 4: Ultimate Edition (card with code included in box) which includes a 4 day early access to the game, Vintage Limited Edition Console Pack, exclusive in-game items, six Gear Packs, and a Season Pass for even more exclusive content, including six additional Gear Packs. Gather your friends and family: the newest installment of the world’s most popular dance game is here! Bust a move and get down with the hottest songs of the year, including new and classic tracks like “Sorry,” by Justin Bieber, “Into You,” by Ariana Grande, “Cheap Thrills,” by Sia ft. Sean Paul, “Lean On,” by Major Lazer and DJ Snake ft. MO, “Can’t Feel My Face,” by The Weeknd, and many more! Your favorite game modes are back, so you can play with friends, connect with people around the world, and have fun working out. So whether you love pop music, want to cut a rug in style, or want to enjoy a great game for families, you have to get Just Dance 2017. 30 days money back and 18 Months limited warranty. Hassle-free friendly customer service through email. 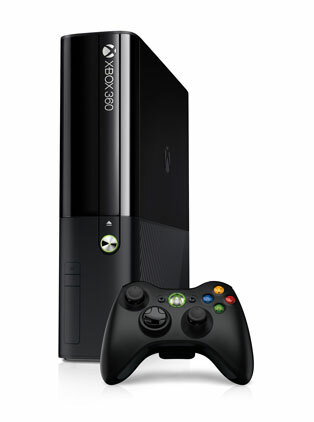 Xbox 360 is ready for tomorrow with a leaner look and a sleek black finish. With built-in wi-fi, you can connect instantly to the world of entertainment on Xbox LIVE, where HD movies and TV stream in an instant. It’s ready for the controller-free experiences of Kinect, where you don’t just play the game, you are the game. The huge hard drive has plenty of space to store your favorite games and movies. Xbox 360 is more games, entertainment and fun. Warranty: The console has a one-year limited warranty. The new console is sleeker and quieter with a stylish design that will be the centerpiece of your home entertainment system. The internal 250GB hard drive allows you to save your games and store television shows, movies, music, pictures, trailers, levels, demos and more extras available from Xbox LIVE Marketplace. Kinect makes YOU the controller. With a dedicated, specialized port, the Xbox 360 250GB is built to connect seamlessly with the Kinect sensor and have you up off the couch and into the world of Kinect in no time. Strategize or trade taunts while playing games, and chat with your friends on Xbox LIVE. 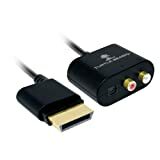 Use Xbox 360 on standard-definition televisions using this connection over traditional composite connectors. Play high-quality audio with the included stereo connector. The new Xbox 360 is the only console with 802.11n Wi-Fi built in for a faster and easier connection to Xbox LIVE. Download or stream HD movies, TV episodes, and games from Xbox LIVE Marketplace in 1080p and 5.1 surround sound from anywhere in the house (compatible with b/g/n networks). This award-winning, high-performance wireless controller features the Xbox Guide Button for quick, in-game access to friends and music. It has a range of up to 30 feet and a battery life of 30 hours on two AA batteries. 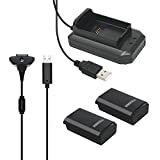 The Turtle Beach Ear Force Xbox 360� Audio Adapter provides RCA (stereo) audio outputs when using Xbox 360� models with an HDMI connection. It also provides an optical audio output (digital) for original Xbox 360 models and works with home theater systems requiring HDMI connections. Use Madcatz, Qanba, Hori, Sony, PDP branded product on your Playstation 4 system! Works with arcade sticks, fight pads, custom controllers, official wired controllers. Works in all games, Mortal Kombt, Street Fighter IV, Street Fighter V Preprogramed profiles for standard controls Customizable control scheme’s Add turbo functions to any controller Updatable firmware! PLUG and PLAY! Just plug the adapter into the system, no setup required! 1. Expand your player for Xbox 360 SLIM experience with downloadable contents. 2. Download and save tons of games, demos, and other add-ons from Xbox LIVE Marketplace. 3. Download and save hundreds of HD movies, television shows, videos, music and more. 4. Save your game, Xbox LIVE gamer profile, game demos, and custom soundtracks. 5. User can even install game discs to this hard drive for quieter gaming, and in some cases, faster load times to protect your XBox360 SLIM. 6. Brand new and high quality, very good price, buy one instantly. XBOX 360 SLIM special 250G Hard Drive, 250G hard drive + assembled shell, and the hard drive can be mounted directly to the XBOX360 SLIM for usage. 2 piece replacement battery back cover’s for the Xbox 360 wireless controller. Comes in set of 2. 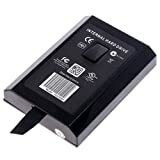 Replacement battery pack for xbox360 controllers.